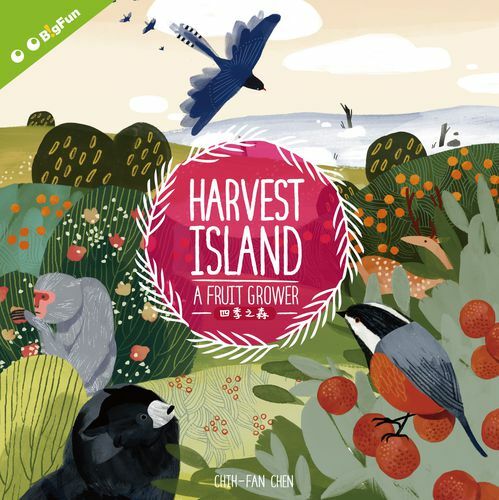 In Harvest Island, players vie to be the most successful crop cultivator on the island of Formosa – as you know, a peculiar island that exists under a subtropical environment especially optimal for growing fruits. The climate is so good that you can grow and harvest fruits in all four seasons. 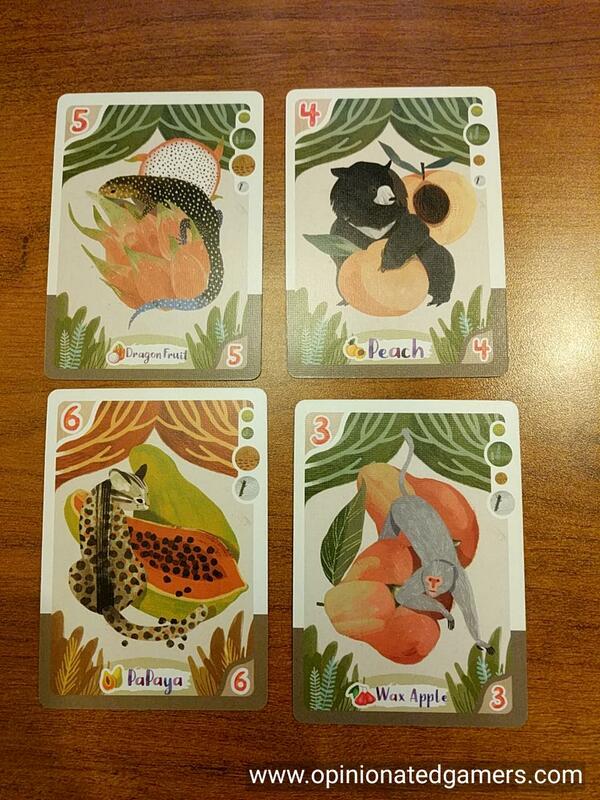 A deck of cards is created for each of the four seasons, combining fruit cards and weather cards (some cards are removed at random in the game setup). Each is set above the matching season column on the game board. There is a numbered track at the bottom of the board, one marker for each type of fruit is placed on the left of this track – so that the first open space is the “4” space. The game starts in the Spring season, and two cards are drawn and placed in the supply area to the left of the board. 3 cards are placed in the row underneath this in the Storage area. Then, each player is given a hand of four cards from the Spring deck. All Weather cards are discarded and new cards are dealt until each player has a hand of 4 fruits. All discarded weather cards are reshuffled into the Spring deck. 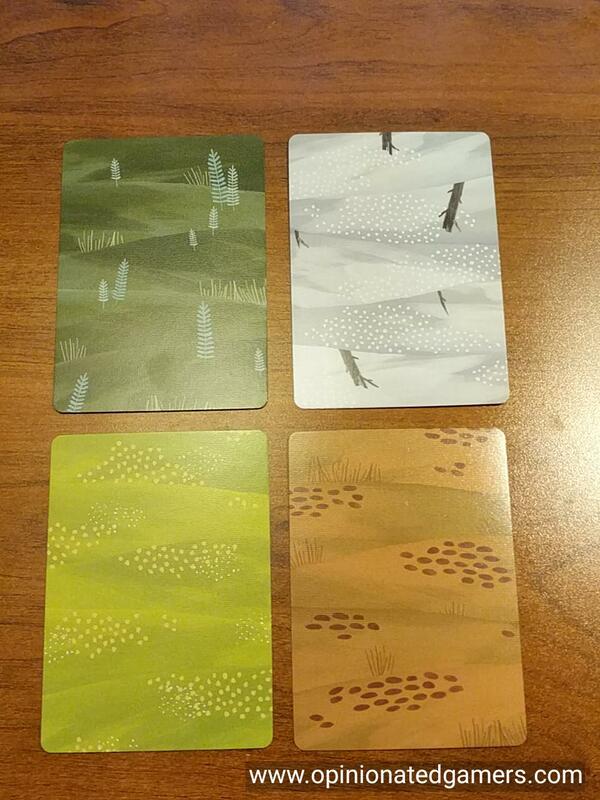 Finally, each player is given a set of three landscape cards (Plains, Hills, Mountains) which are placed on the table in a row. Play goes clockwise around the table, and on each turn, the active player takes a single action – either CULTIVATING or HARVESTING. When you cultivate, you play two cards from your hand. There are a number of different possible actions that can be taken with the played cards. You can SOW a seed by tucking a fruit card underneath a landscape care which does not already have a seed. You can PLANT a fruit by placing a fruit card on top of a landscape card which matches the seed underneath. Each landscape card has a card limit (counting both cards above and below the card). You can FERTILIZE a field by placing a fertilizer card on top of any landscape that already has a seed. You can also RELEASE a fruit card by placing it in the storage area to the left of the board. Once you have played you cards, you must now draw back up to four cards. You can always draw cards from the supply area next to the board. You can also always draw from the current season deck (and if you draw the last card in the current season deck, you simply move onto the next season’s deck). If you draw any weather cards, these are immediately placed face up on the board (and then you check for a weather catastrophe – see below) and you keep drawing new cards. IF and only if you played both of your cards into the Storage area (thru the Release action), you can choose to draw ONE of your cards from the Fertilizer stack. Finally, you now look at the Storage area – if there are four or more cards in the Storage row, the current Supply row is discarded and the cards in the Storage area are moved to the Supply row. 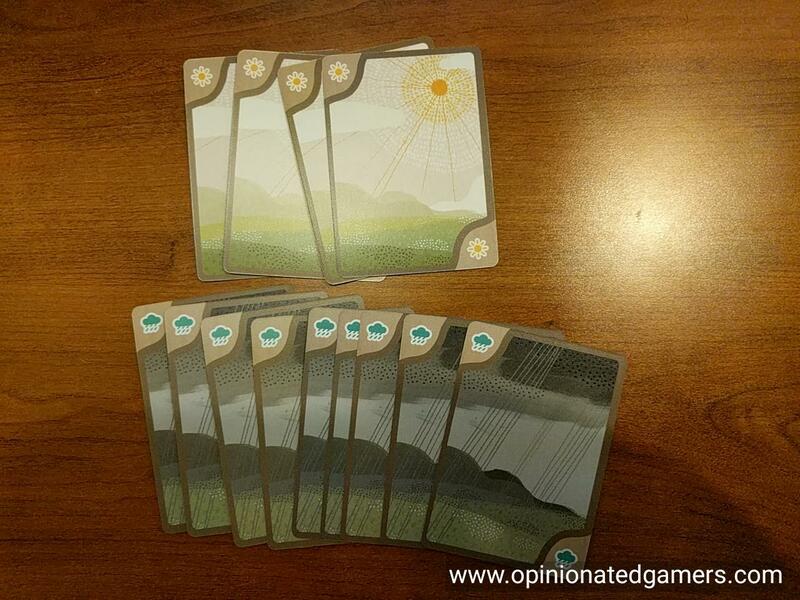 Weather Cards and Catastrophes: The weather cards come in 2 varieties: Sun and Rain. Any time you have one of each type, they cancel each other out and are discarded. If you ever get three cards of the same time, then there is a catastrophe. Each player looks at his own fields, and finds the one with the most cards in it; if there is a tie, the player can choose which field is targeted. That field must have half of the cards discarded from that field – and you must remove fruit cards with the highest value first. You cannot discard Seed cards or Fertilizer cards; therefore only planted Fruits can/will be removed. When you harvest, you choose any number of your fields and take the planted Fruit cards and place them face down in front of you to score as points. Count up the total number of cards in the harvested field (noting that Fertilizer cards are worth 2 cards!). If you total number is greater than the numbers space on which that fruit’s marker currently stands, you move the marker to the number matching your count and then you take the Harvester medal for that fruit. Then, any fertilizer cards are placed back in the Fertilizer stack and any cards used as Seeds are discarded. The game continues until the Winter deck is exhausted. When the last card is drawn, the game continues to the end of the current round so that all players have an equal number of turns. Then players calculate their scores. All facedown harvested cards are worth the number in the top left corner. Each Harvester medal is worth 8 points, and each Fruit card, seed card and fertilizer card remaining on the table is worth 2 points each. The player with the most points wins. Harvest Island is a simple but challenging hand management game. The mechanics are quite straightforward and simple, yet the player has a number of choices that will ultimately affect his score. 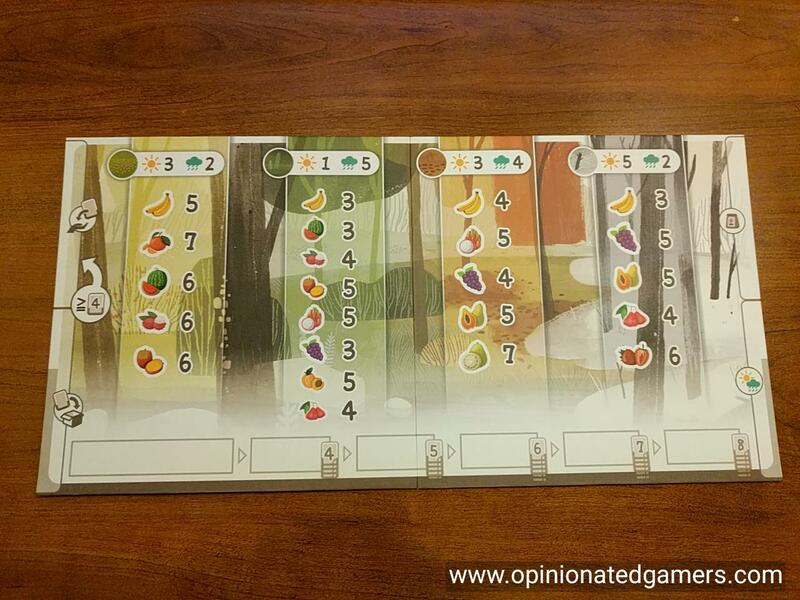 There are twelve different fruits in the game, and they show up at different times of the year – the game board gives players a nice reminder of how many cards of which type of fruit could be in the deck for that season. 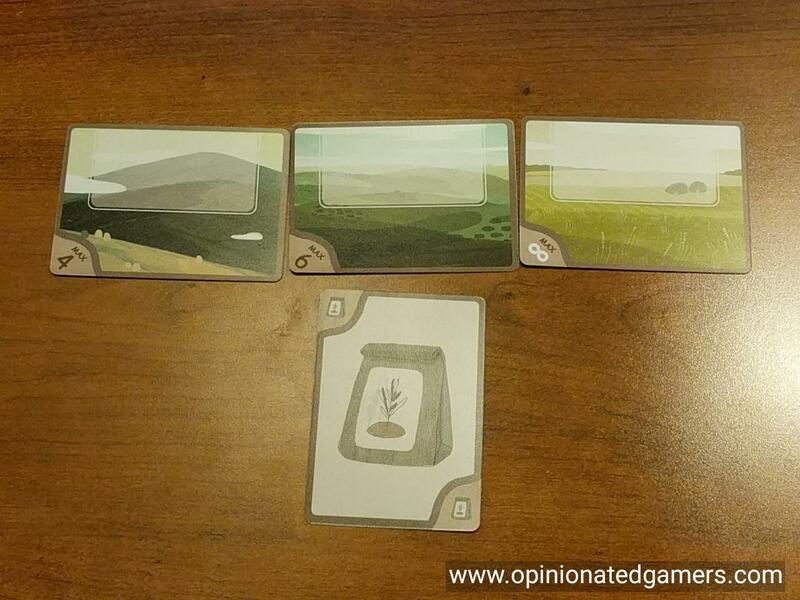 As you only have three fields to plant in, you have to try to get cards into your hand that you can use. You’ll need at least two cards on any particular fruit in order to score points as you’ll need one for the seed and then one for planting. You could choose to harvest fruits quickly – you’ll not score as many points with each harvest, but you will be less likely to have cards that you can’t play in your hand. On the other hand, you could go for larger collections of a fruit – this will lead to a bigger payday as well as the potential for the 8 point Harvester medal bonus… but you’ll likely end up spending some turns digging for the right card. You can also invest time to gain Fertilizer cards, and these can definitely be useful to gain the Harvester medals – but you must “waste” a whole turn Releasing cards in order to be able to draw a single Fertilizer card. Players must also keep an eye on the ever-changing weather card situation. An ill-timed catastrophe can be devastating to your scoring – if it appears that a catastrophe is coming up, sometimes players will take the safe road and harvest a field early just to lock in the points. Other than watching what’s on the board (and what’s already been seen), there’s not a lot else you can do about the weather as they just come up in a random draw. For me, this is a nice balance of choices, and while each individual decision is easy to make – the long term decisions can be tough. Card counting skills can come in handy to help you assess the chances of drawing a desired card on a later turn, and this will help you determine whether you should harvest a particular field early or not. When you’re looking at the main board, remember that the fruits will always be found in the same relative order – but the icons will not all be at the same horizontal level because the overall distribution of fruits changes in each season. Thus far, I have not yet found an optimal strategy – and I’m not sure that there is one. Your choices on how to plant and harvest the cards will be a constantly mutable thing – dependent on what you can see available to draw in the Supply area, what cards you think are still remaining in the deck, and most of all, dependent on what your opponents have chosen to collect and play themselves. Sometimes, it’ll be best to try to harvest rapidly and make sure that you have useful plays each turn. Sometimes, it’ll be better to try to go for the big play with a large stack of fruits and maybe a fertilizer or two. I’ve really enjoyed my initial plays of this, and I look forward to continued exploration of this game. Jonathan F. – I like this game way more than I expected to. It was eye candy at an impulse purchase price. We got it home and the rules were pretty straight-forward, it it was hard to see how it all fit together. The push-your-luck with the weather was pretty exciting and we figured out quickly why the fields have different sizes. I wanted to steal the mango Harvester medal, but could not because I had planted my mango seed in a field that was too small to pull it off. Each fruit has two symbols – the one with the animal, which is the center of the card and the Harvester medal and a second one, which is just the fruit and is on the bottom of the card and on the board that shows the distribution of cards. Yes, apparently wax apples are pretty triangular. Removing cards from certain decks for certain player numbers both affects the game length and also eliminates card counting. Really nicely done. I like it. Dale Y, Jonathan F.